Celebrating an impressive 45th year of existence, french progressive rock titans and Zeuhl pionneers made the ambitious effort of booking not one but 12 dates in Paris, spanning from the 5th until the 22nd of November. These 12 shows offer the fans a chance to see the band perform the Köhntarkösz trilogy for the first time, in a cozy and intimitate environnement. Tonight's lineup consisted of an 8 piece formation, with Stella Vander, Hervé Aknin, Isabelle Feuillebois and Julie Vander on vocals, Jérémie Ternoy on the piano, Benoit Alziary on the vibraphones and glockenspiel, James Mac Gaw on the guitar, Philippe Bussonnet on the bass guitar and Christian Vander on the drums. I'll admit I had my doubts regarding the quality of the performance of a band of such old age, but these doubts quickly vanished after the first few minutes of the show. Every single musician on stage tonight was at the top of their game to tackle the extremely complex, dense and technically demanding compositions of france's most unique progressive rock act. One can only be floored by the dexterity with which each musician juggled between synchronised harmonies and melodic or rhythmic counterpoints over the jazz-inspired polyrhthmic grooves of drummer Christian Vander. The vocalists delivered no less than the pitch perfect performance required to blend their melodies with the other instruments to create a wide range of organic and unique blends of timbres. Rhythmic and melodic duties were traded between members, giving each and every one of them a chance to shine on every aspect at one point in the set at least. This great performance was supported by a fantastic job done by the sound engineer whose mix allowed the music to fully immerse the audience into a trance-like experience into another world. Everything was perfectly audible like on a studio recording. The sound guys' job was certainly not an easy one either, considering the wide range of instruments and musicians on stage. I will however point out the fact that the drums occasionnaly overpowered the rest of the instruments during certain parts of the set, particularly the cymbals that clashed and hindered the audibility of the vocals. The show lasted well over 2 hours with a short intermission around the middle but with practically no breaks whatsoever, showcasing the formations' insane level of stamina. 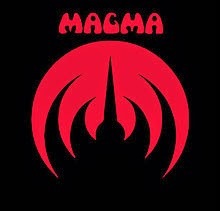 In short: tonight Kristian Vanders' Magma have evidently proven that they are still at the top of their game after all of these years, fighting relentlessly to keep their cult-status just as relevant as it has always been throughout the years. Visit their official website at http://www.magmamusic.org/ and be sure to catch their remaining shows next week at Le Triton (be quick, dates are selling out fast! ).